Edraw can fill the selected shapes with a solid color, gradient, texture, hatch or picture. It can also add the blur shadow and change the shape transparency. Fill refers to the interior of a shape or line. On the Shape Format tab, in the Style group, click the Shape Fill button. Then choose a fill option that you want. To make a shape transparent or colorless, or to remove fill from a shape, click this option. To add color and transparency to a shape, click this option. Color To choose a color for the shape, click Color, and then click the color that you want. To change to a color that is not in the theme colors (theme colors: A set of colors that is used in a file. Theme colors, theme fonts, and theme effects compose a theme. ), click More Colors, and then either click the color that you want on the Standard tab, or mix your own color on the Custom tab. Custom colors and colors on the Standard tab are not updated if you later change the document theme (theme: A combination of theme colors, theme fonts, and theme effects. A theme may be applied to a file as a single selection.). To set the transparency, you need rich click shape, then click the Shape Format item in the context menu. To add a gradient (gradient: A gradual progression of colors and shades, usually from one color to another color, or from one shade to another shade of the same color.) fill to a shape, click this option. 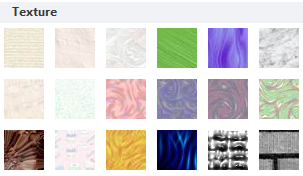 Preset Colors To choose a built-in gradient fill, click Preset colors, and then click the option that you want. Direction To choose a different progression of color and shades, click Direction, and then click the option that you want. The Directions that are available depending on the gradient Type that you choose. Angle To specify the angle that the gradient fill is rotated within the shape, enter the degree value that you want. This option is available only when you select Linear as the Type. Gradient stops consist of a position, a color, and a transparency value. The transparency value applies to the gradient stop, not to the overall fill. Gradient stops are used to create non-linear gradients. For example, if you want to create a gradient that goes from red to green to blue, you need to add three gradient stops — one for each color. Or, if you want to create a gradient that shows up only in the corner of a shape, you need to use gradient stops to make the gradient non-linear. Stop list The gradient fill is made up of several gradient stops, but you can change only one gradient stop at a time. When you click the gradient stop that you want to edit in the list, the position, color, and transparency options reflect the current settings for that gradient stop. Add To add a gradient stop, click Add, and then set the Stop position, Color, and Transparency that you want. Remove To delete a gradient stop, click the Stop number in the list that you want to delete, and then click Remove. Stop position To set the location for the color and transparency change in the gradient fill, move the Stop position slider or enter a number in the box next to the slider. Transparency To specify how much you can see through the shape at the specified Stop position, move the Transparency slider or enter a number in the box next to the slider. You can vary the percentage of transparency from 0 (fully opaque, the default setting) to 100% (fully transparent). 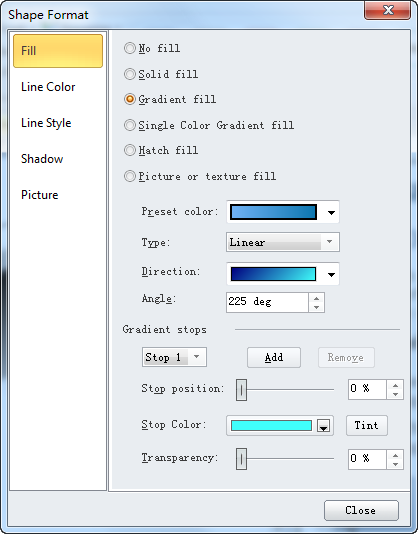 You can change the color, effect, or offset of a shadow by using the options below. On the Shape Format tab, in the Shadow group, click the Shadow button then choose a built-in shadow effect that you want. On the Shape Format tab, in the Shadow group, click the Shadow button then click the Shadow option item. In the popup property sheet, click the Shadow property page. To choose a color for the shadow, click Shadow Color in the Shadow button, and then click the color that you want. To change to a color that isn't in the theme colors, click More Colors, and then either click the color that you want on the Standard tab, or mix your own color on the Custom tab. Custom colors and colors on the Standard tab are not updated if you later change the document theme. To specify how much you can see through the shadow, move the Transparency slider or enter a number in the box next to the slider. You can vary the percentage of transparency from 0 (fully opaque, the default setting) to 100% (fully transparent). To specify the size of the shadow relative to the size of the original object (object: A table, chart, graphic, equation, or other form of information. Objects created in one application, for example spreadsheets, and linked or embedded in another application are OLE objects. ), move the Size slider or enter a number in the box next to the slider. To set the radius of the blur on the shadow, move the Blur slider or enter a number in the box next to the slider. The larger the radius, the blurrier, or "fuzzier", the shape or line will be. To specify the angle at which the shadow is drawn, move the Angle slider or enter a number in the box next to the slider. By using the Angle and Distance options together, you can place the shadow anywhere relative to the shape. To set the distance that the shadow is drawn in the Angle of the shadow, enter a number in the box next to the slider. To use a picture as fill for a shape or to add texture to a shape, click this option.